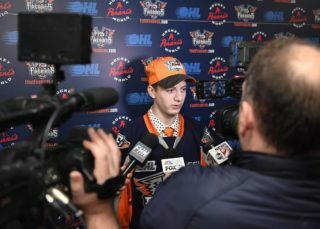 Flint, Mich. – The Flint Firebirds announced today that forward Eric Uba (pronounced you-buh) has committed to an Ontario Hockey League (OHL) Standard Player Agreement and education package with the Firebirds. Uba, a native of Kitchener, Ont., was heavily recruited with NCAA options before choosing to continue his hockey and academic development in Flint. The 5-foot-11, 190-pound right-winger has notched 21 points (8G, 13A) in 37 games with the Wellington Dukes of the Ontario Junior Hockey League (OJHL) this season. Prior to playing with Wellington, Uba amassed 62 points (28G, 34A) in 40 games with the Ayr Centennials (PJCHL). He played his AAA youth hockey with the Kitchener Jr. Rangers, racking up 42 points (17G, 25A) in 33 games. 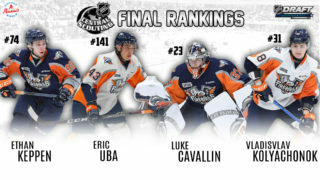 Flint Firebirds 2016 Ninth Round OHL Draft Pick Eric Uba. 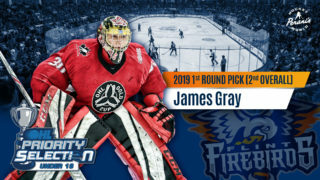 Uba, was selected by the Firebirds in the ninth-round, 164th overall in the 2016 OHL Priority Selection. He joined the Firebirds for practice Wednesday and will wear jersey number 17. The Firebirds return home to the Dort Federal Event Center Thursday, Dec. 28 against the London Knights. Thursday’s game at 7 p.m. marks the fourth “College Night” this season, featuring $2 beers and $2 hot dogs for all fans in attendance. All college students with valid identification will also receive $2 off admission.